Giving a teenage girl a modern bedroom makeover without breaking the bank! If you're a mom, you know exactly what I mean when I say, "I can't believe how fast my kids have grown!". But when your baby is about to become a teenager in just a few short weeks...well, that's a whole other deal! 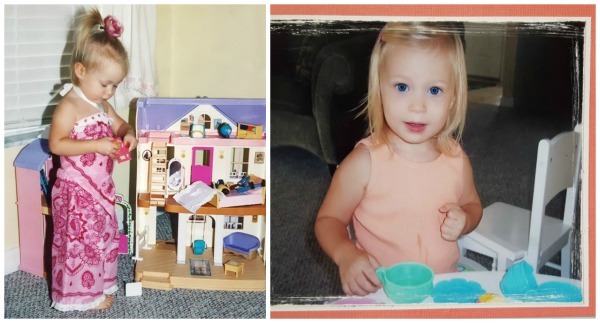 My baby (known as little DIY on this site), requested a room makeover. ...she wanted a modern teen room makeover!!! And while my personal preference is farmhouse and vintage and shabby and the-older-the-better...I am proud of little DIY for her fledgling independence and for knowing her own mind! In the 10 months that we've lived in this home, little DIY's bedroom hasn't received much attention. She is using the queen-size bed and nightstand that was previously in our guest room in our home in TN. As happy as she was to upgrade from a twin to a queen, she had some definite ideas about how she wanted her room in our new home to look. As little DIY and I talked about what she wanted and she showed me pictures on Pinterest, I realized she wasn't after a sterile modern bedroom, she just wanted a simplified, cohesive room. She wanted her bedroom to feel calm and restful...rather than the cluttered mish-mash that was her current room! I knew I could do that! We talked, made a plan, and reached a few compromises in order to stay within budget. One of those compromises was her bed. Instead of a brand new bed, we agreed that I would paint her queen-size bed. 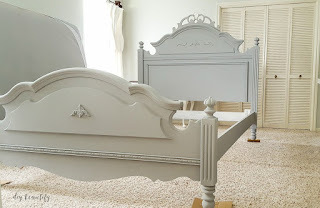 You might remember this bed from when I originally painted the honey oak. It was the second piece of furniture that Mr DIY and I purchased after our wedding, nearly 25 years ago! 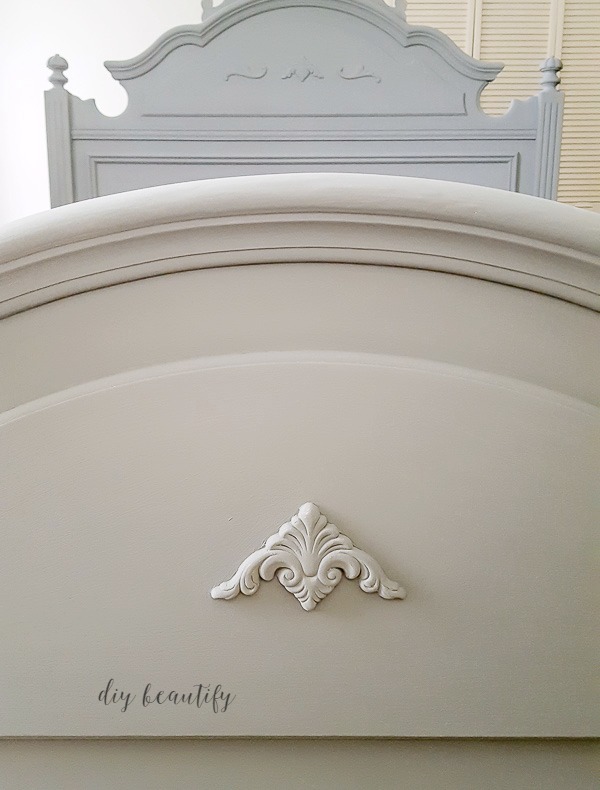 It's a gorgeous bed, very dramatic, and when I painted it the first time around, the results were a pretty country French. But first things first. 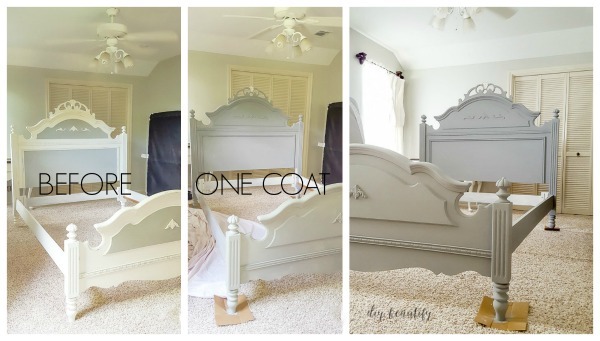 Let me share our overall goals for this teenage girl bedroom makeover! Now that you know the plan, let's take a look at some pictures and what I've accomplished so far. 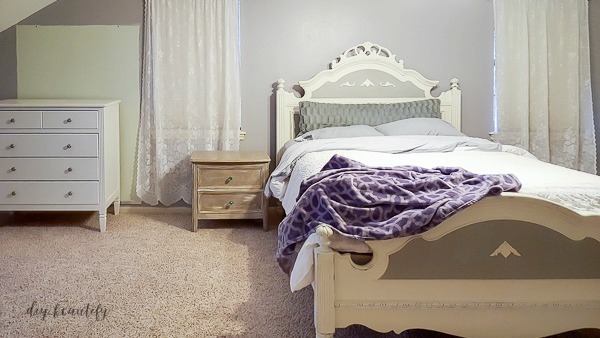 Here is what her room looked like before we tackled this makeover. It actually looked much worse in person! Leftover lace curtains from previous owner, walls that were a dark gray with a very purplish undertone. 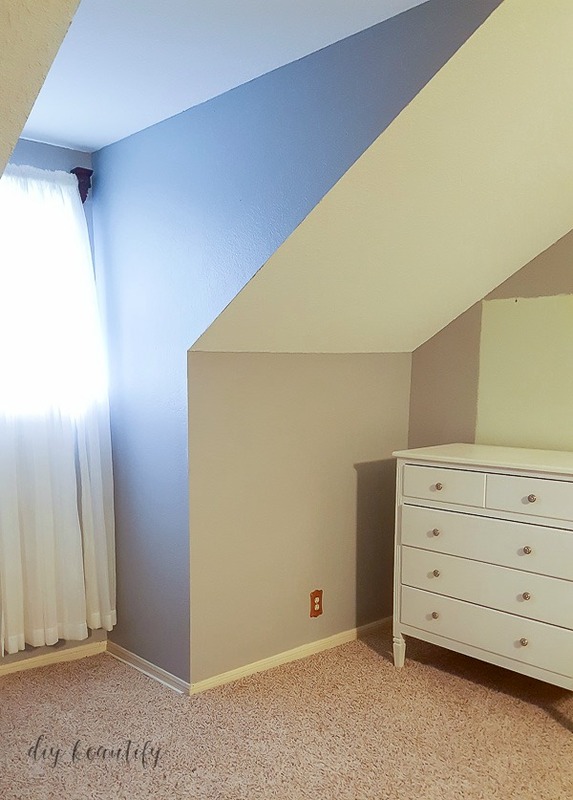 You can see the mint green patch behind her dresser and below, the dormer really jumped out because of the gray paint. Oh, and we can't forget those very 80's oak switch plates!! 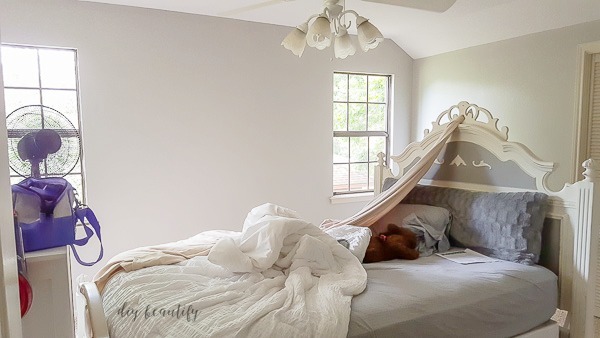 After moving all the furniture into the middle of her room, I proceeded to paint the walls (except the dormers) with Repose Gray by Sherwin Williams...my current favorite light gray that is a true gray. I was fortunate to have leftover paint from when I painted my farmhouse kitchen, dining and sitting rooms. The dormer got two coats of white which helped it recede. In these pictures, the walls don't look much different from the 'before'...I was having issues with all the light pouring in the windows to really get a true read. Here is the a close-up that I took as I started painting...Repose is the light gray on the left, the original paint is on the right. You can see there is actually quite a big difference! 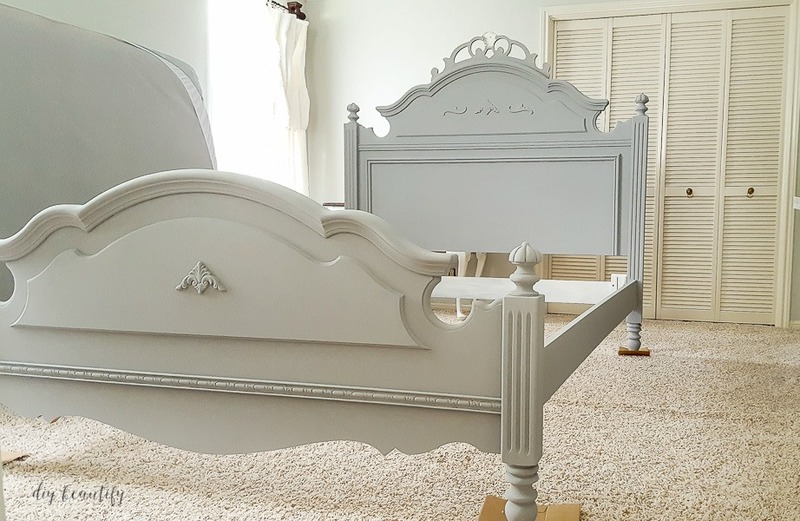 Once the walls were painted, it was time to paint her bed. We decided on a dark, matte gray. 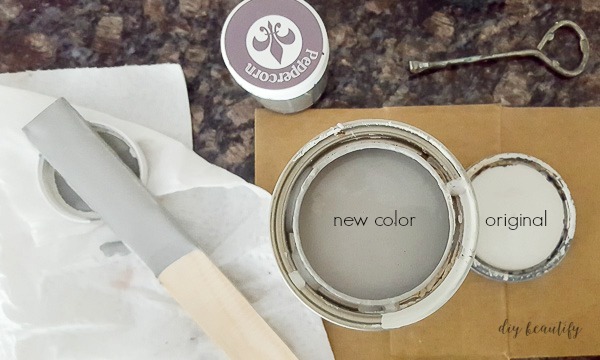 I had some samples of Wise Owl Chalk Synthesis Paint and after mixing two grays together, came up with the perfect dark gray. I mixed Peppercorn (very dark) with Limestone (light) to get the medium/dark gray you see below. This paint is creamy, smooth and provided great coverage! 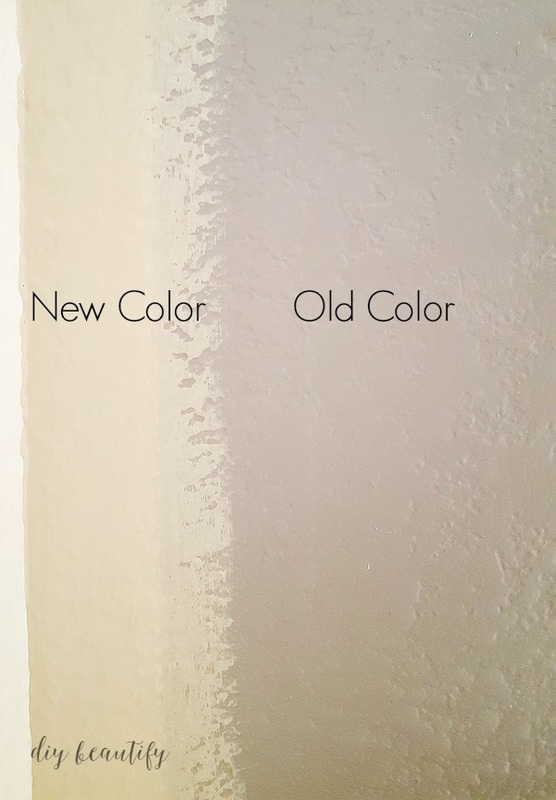 I have absolutely no qualms about mixing paint...last year I achieved a beautiful robins egg blue for an armoire makeover by mixing not only different colors but different brands of chalky paint. You can see that makeover here. It took 2 coats to completely cover the previous finish. I did not wax because little DIY wanted a really matte look to the bed. 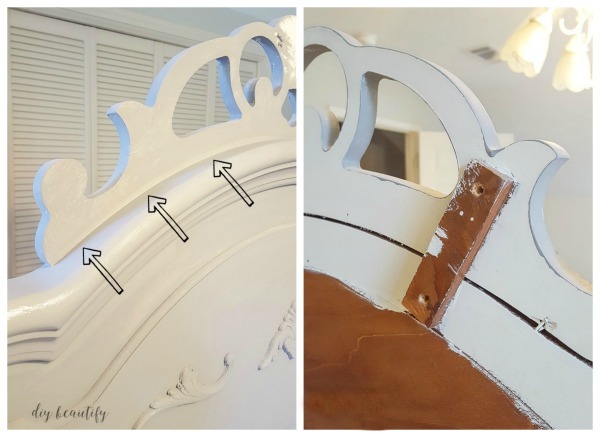 Modern usually means high sheen and glossy surfaces, but in this case we were trying to modernize this Victorian mansion bed and a solid color with a matte finish seemed to be the best budget-friendly choice. ...but there was something else holding it in place and I wasn't able to get it off. I had to wait until Mr DIY came home and removed it. Taking that crown off completely changed the look of the bed. The hard part is done, and now we get to go shopping! Next up I'll be sharing some dramatic DIY artwork that little DIY and I made together, and the pillows we found for her bed. While we kept the large pieces in her room neutral, we added a healthy dose of fun color with the artwork and accessories and I can't wait to show you how it is all coming together! What do you think about our compromise with the bed? 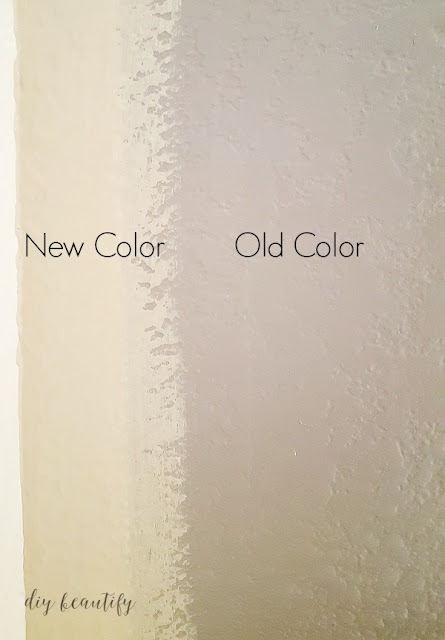 Were we successful in making it look a little more modern with our paint choice? Oh Cindy this is going to be a fun project for sure. Nothing like doing a teen girls room. I am looking forward to it. Thank you Mary! It has been a lot of fun working on this room! Bed looks great, especially without the crown. There will be plenty of "Princess Moments". But at least she will not have the crown. Love what you have done so fat. Just found you on Pinterest and now I’m so enjoying your blog! Hope will get more interesting DIY makeover from you.